Tie each piece of the pig’s head into a thick sausage shape using butchers twine, your butcher may do this for you, but give it a go. Next, make brine by adding the salt to the water and bringing to the boil along with 3 bay leaves, the thyme, the onion and the blade of mace. Remove from the heat and allow to cool, and when it’s cold, submerge the pork and leave it covered in a cool place for up to 7 days. I usually leave it for 3 to 4 days to take on all the flavour of the aromats. Once they are cool, lay 2 or 3 layers of cling film on a work surface and remove the twine from the chaps. Now roll them up in the cling film - nice and tight – and pop them in the fridge overnight. Then blanch the kale in boiling, salted water for 2 minutes. Meanwhile, melt the butter in a pan, and stir in the mustard before adding the drained kale. Season with salt and pepper. 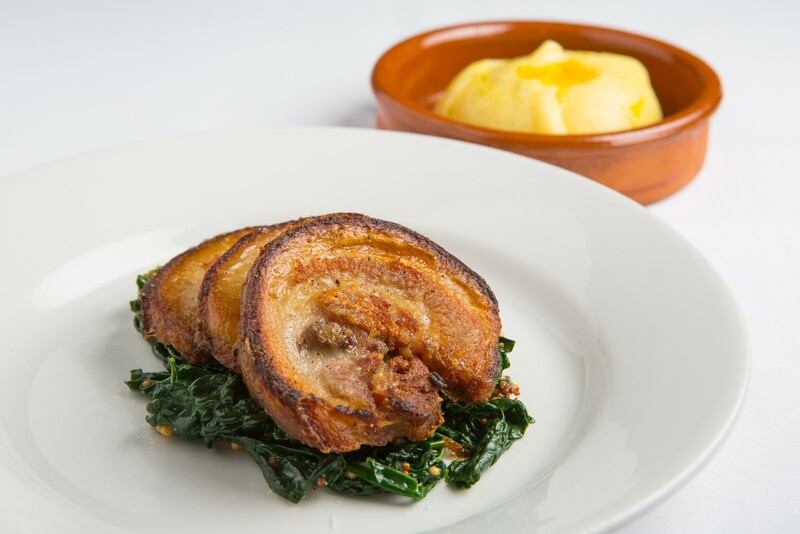 To serve, divide the kale between four warmed plates and top with the crispy, browned chaps. Delicious served with a buttery mash. Take your tatties to the next level, with this tasty recipe using the famous Stornoway Black Pudding. It’s impossible to think of Scotland without thinking about the Big Three: haggis, neeps and tatties.